On paper and on the screen, they couldn’t be more different. One is a novel about love — for people and for stories — set against the backdrop of a Nazi-occupied island in the English Channel after World War II. The other, a sprawling, decade-spanning tale of crime and corruption in Mumbai. 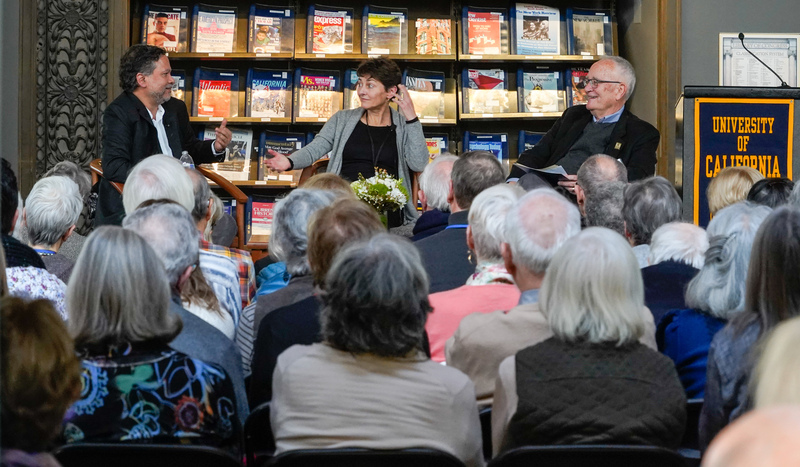 But at this year’s Luncheon in the Library, authors Annie Barrows ’84 and Vikram Chandra united onstage for a genre-crossing conversation about their books, their craft, and what it was like to see their respective novels leap from page to screen. Chandra is the author of 2006’s Sacred Games, and Barrows co-wrote, with her late aunt Mary Ann Shaffer, 2008’s The Guernsey Literary and Potato Peel Pie Society. Before Netflix’s Sacred Games and Guernsey were ushered into existence, there was the question of logistics: How could anyone possibly transform the works into stories for the screen? 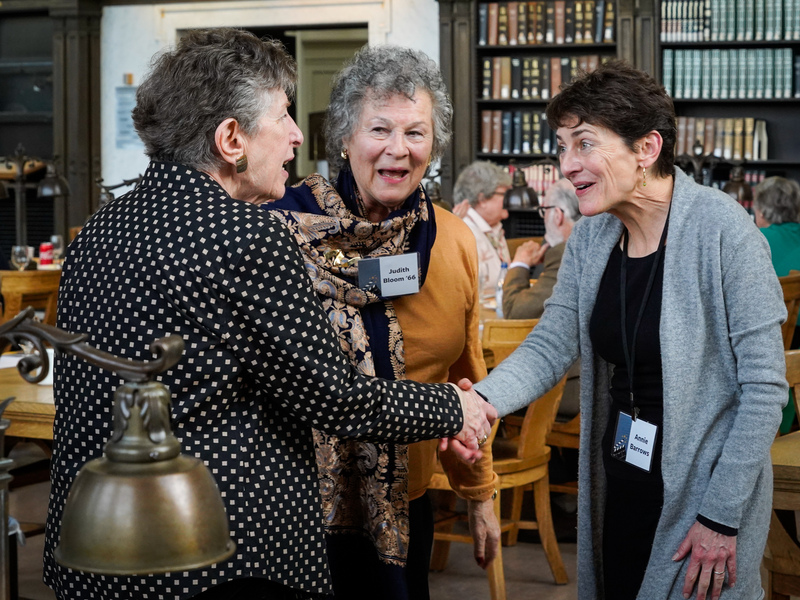 “I couldn’t understand how they could make a 900-page book into a series,” said Chandra, who teaches creative writing at Berkeley, during a discussion in Doe Library led by David Duer, the Library’s former director of development. Guests eat lunch in Doe Library’s North Reading Room on Jan. 19. As with any adaptation, the stories were tweaked, massaged, and prodded before coming alive on the screen. Adapting a novel “requires radical measures,” Chandra said. Among the changes in making Sacred Games a series, for example, was pushing one of the parallel narratives from the early 2000s to the present day and axing some of the quieter scenes. Despite the changes, seeing their imaginations come to life was thrilling — and something that few people ever witness. Luncheon guests Judy Bloom, center, and Paula Goren meet author Annie Barrows, right. During the talk, the authors also pulled back the curtain on their writing — and reading — habits. Barrows starts writing in the morning and typically stops at 4:30 p.m. Chandra gives himself a word count: 400 per day. And both are fast readers, but Chandra likes e-readers, and Barrows prefers physical volumes. Then came the million-dollar question: How do Barrows and Chandra elevate words on a page to stories that are truly transcendent? “I think if I was aiming at it, I would miss it,” Barrows said. Among the 230 people who came to the luncheon was attorney Gina Marek, who was with her mother, Angi Merlone, and the smallest member of the luncheon’s audience: her new baby, donning a tiny unicorn hat, horn and all. 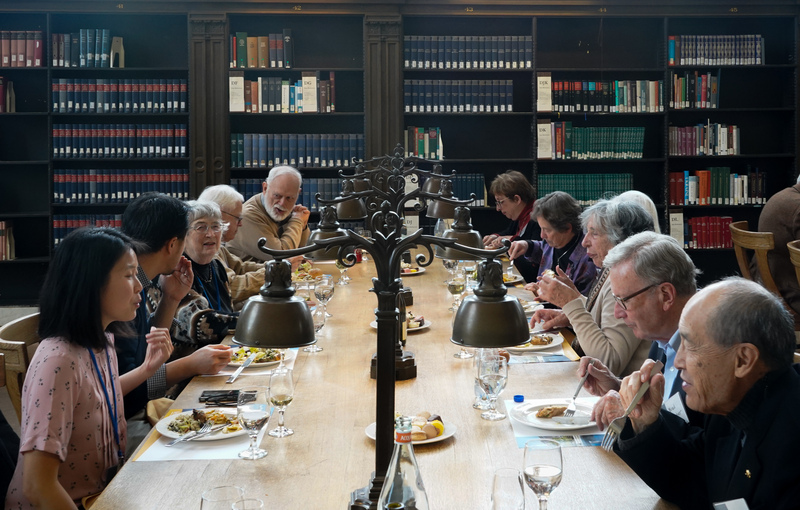 The Luncheon in the Library is a private, invite-only event honoring Library supporters. Past speakers include Chancellor Carol Christ; lecturer, historian, and journalist Adam Hochschild; and dancer, singer, and actress Rita Moreno.